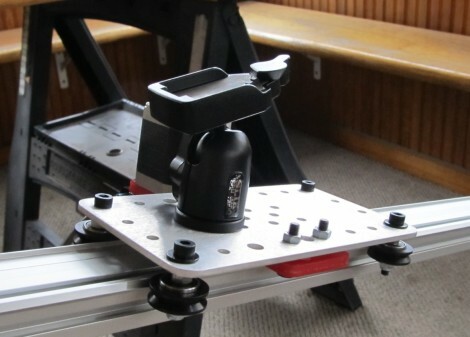 Here’s a camera mount that moves smoothly along a motorized sled. [Bart Dring] created the system and was surprised by it’s popularity, having received several sales requests from photographers. He originally designed the linear bearing system, called the MakerSlide as an inexpensive alternative to other CNC machine solutions. Allowing a computer to map out timed movements for video shots wasn’t on his radar then, but as you can see in the clip after the break, the MakerSlide does an amazing job at it. The modular track system makes it easy to attach to a base. In this case, a couple of pieces of acrylic let him support both ends of the track on standard camera tripods. [Bart] mentions the knowledge gap between people who work with CNC milling hardware and photographers as an issue in deciding how to control the system. Since photographers aren’t likely to be proficient in EMC2, he designed a control application with an Arduino. It uses a stepper motor controller shield, and does some fancy math to make sure there is smooth acceleration, etc. Congrats Bart on another great product! Nice! I now own this prototype. Still playing around with the arduino code but it should end up being a nice and simple solution for a camera slider. Especially considering that most sliders start at $300 WITHOUT any electronics. Even though his Kickstarter was funded and the trial run was completed I have not found the Makerslide available for sale anywhere yet. This camera rail is a great additional use, I’m sure many others will be discovered. I’m currently building a box joint jig for my table saw. Your interface seems perfect for controlling sequential movement of the material stock along it’s single axis. I’m using nice ball bearing drawer slides but I like your off the shelf solution. Again with the makerslide? Has this become less vaporware? MakerSlide is currently available for selected projects (ShapeOko, 2.x Laser, Camera Slider) at the MakerSlide web store. It will be available for general sale the first week of January. The Makerslide isn’t vaporware. I’ve got 24′ of it at my house. He’s got enough stuff to kit up stuff to build the buildlog 2.x laser but I think he’s waiting on a bunch of parts for the generic carriage parts. Why is it that the use of internally wrenching fasteners (aka allen key bolts) instantly make a project so much more serious and cool looking? i would defenitely buy one for dslr use. Maybe even one extra for my cnc building project. Cannot wait for this stuff to become generally available. I need a motorized elevator camera mount, hopefully with also horizontal movement to allow the camera to focus ( as the camera has no automatic focusing). If anyone has idea, suggestion, where I can buy one, please contact me.